Sean Petty describes the approach that socialists have developed over generations for being a socialist at work and in the unions, in an article based on a presentation at Socialism 2018 in July. Sean is a registered nurse in New York City and member of the board of directors of the New York State Nurses Association. This article is part of the International Socialist Organization’s (ISO) Socialist at Work Toolkit assembled by the ISO’s Labor Working Group. We hope this collection of articles — as well as the experiences of socialists that went into it and will come out of it — contributes toward reconnecting today’s revived socialist movement with the rich history of labor struggle in the U.S. Only in the U.S. is socialism seen as foreign to unions and shop-floor struggles. It’s high time that changed. At SW, we’re publishing articles from the Toolkit along with contributions from our readers about their own experiences, collected in a series called Socialists at Work. Please consider contributing your own stories and the lessons you’ve drawn from them in an e-mail submission to SW — or just tell us what liked, or didn’t, about this series. IN THE last year, we have seen some very important developments in the labor movement in the U.S.
Last spring, the teachers of West Virginia, 55 counties strong, kicked off an actual strike wave, the first of its kind in the U.S. in decades. These “red state” teachers’ strikes were led, first and foremost, by pockets of militant rank-and-file teachers who organized a struggle that pushed past anti-union laws andthe conservatism of their own union leaderships to directly confront their state governments’ latest criminal devaluation of teachers’ and students’ lives. A short time later, the U.S. Supreme Court, as expected, dealt the single largest legal blow to unions since the Taft-Hartley Act of 1947, with the Janus v. AFSCME decision, which overturns the requirement that workers in public-sector workers covered by a union contract but not members of the union pay contributions. Without an ongoing rank-and-file upsurge in the public sector, this decision will fundamentally and critically weaken unions’ institutional ability to protect workers’ wages and working conditions. It will also weaken public sector unions’ ability to fight against the ongoing dismantling of public services — whether in education, health care or the myriad of other necessary social services. So it is a very good time for socialists and other union and left activists to take a step back and take a deeper look at some of the structures and dynamics of unions under capitalism. I want to articulate some theoretical guideposts for how we in the ISO, other socialist and radical left activists, and fellow union militants can navigate important questions about how to best rebuild and extend working-class power in this country. UNIONS ARE the main organizational forms resulting from working people’s perpetual struggle to have some control over some of the most important aspects of our lives — namely, our economic well-being and how we are treated at work, the place where we spend a significant amount of our waking lives. The fight for unions can involve both economic and political demands — meaning the fight for immediate economic improvements from employers, as well as, if we’re lucky, demands on the state to increase rights on the job, tackle particular attacks against sections of workers, and create better conditions in our communities. Unions under capitalism are a self-limited project, meaning that they exist because socialism doesn’t. They are ultimately necessary because of the exploitative and oppressive working conditions that are necessary for capitalism to exist. Therefore, unions as institutions don’t have an inherent interest in uprooting the social relations of capitalism. In fact, their existence is built on them. They exist to negotiate the conditions of exploitation and oppression, not to end their root causes. They are organizations designed and developed to reform present conditions. It takes conscious socialist political organization to overcome the limitations inherent in trade union organization and ultimately push beyond the see-saw of organizing for and winning better conditions, only to have them taken away or conceded years later. Using strikes and other forms of mass collective working-class struggle and organization to confront capital and the state are the only ways that working people can ultimately shift the balance of power permanently in our favor. Recognizing this does not mean that socialists should be dismissive of unions in any way. We know that unions are also some of the important schools of struggle, organization and power for working people. Even smaller battles short of strikes, both inside and outside the workplace, can mightily help advance class consciousness and create the conditions for the development of revolutionary socialist consciousness and organization. Union struggles can bring many things to light for us and our co-workers — first of all, the true colors of our bosses and our governments. They force us to think about what ideas we need — and what ideas we have to combat — to truly bind ourselves together as working people in order to be stronger and more successful. UNIONS HAVE been developing under capitalism since its birth. They now exist in most countries and have for some time. Most unions, especially in more developed countries, have developed elaborate structures, with full-time officials, elected leaders and paid staff members. Over time, these structures — because of their degree of removal from the life of the rank and file, and because of pressure from capital — become ossified and bureaucratized, meaning they develop and take on interests and a life of their own apart from the objective interests of the rank and file. The trade union bureaucracy is a distinct, basically conservative, social formation. Like the God Janus it presents two faces: it balances between the employers and the workers. It holds back and controls workers’ struggle, but it has a vital interest not to push the collaboration with employers and state to a point where it makes the unions completely impotent. For the official is not an independent arbitrator. If the union fails entirely to articulate members’ grievances, this will lead eventually either to effective internal challenges to the leadership, or to membership apathy and organizational disintegration, with members moving to a rival union. If the union bureaucracy strays too far into the bourgeois camp it will lose its base. The bureaucracy has an interest in preserving the union organization which is the source of their income and their social status. There are a number of different ideas to unpack from this passage. For starters, because of its profound contradictions, nothing is static under capitalism — everything is in constant motion. The voracious needs of capital to constantly increase profits and economic growth clash with the constant struggles and degrees of organization of working people who are trying to fight against this organized theft. From the standpoint of the bureaucracy, the goal of unions is their continued existence, so this layer is compelled to try and balance this contradiction. Sometimes, this means waging a fight, which involves agitation and increasing expectations and organization. But most of the time, it means dodging a fight, which involves organized passivity, willful ignorance, lowering expectations and even undermining rank-and-file organization. We have only to look at the massive bureaucracies of unions like the International Brotherhood of Teamsters or Service Employees International Union to know that there’s not much distance between German in 1890 and the United States in 2018 in this regard. Luxemburg’s recognition of the bureaucracy’s “narrowness of outlook” is also singling out another conservative influence on trade union officials: that they are compelled to represent the interests of a politically heterogeneous working class in a given workplace or sector of the economy. This creates a political framework that skews their approach toward the lowest common denominator of working-class consciousness in a given time and place. In addition, professional trade unionists, especially at the higher levels, are at least a significant step removed from the lives of the workers they represent. They are not subject to the same oppression of supervisors, they usually make significantly more money, and they are immune from layoffs and other threats to job security that are routine for the rank and file. Their degree of distance from rank-and-file life, their role negotiating the terms of exploitation, and their actual lack of control over economic conditions means they take on the characteristics of the middle class under capitalism, which includes attempting temper its central contradictions and vacillating in the wider class contest. This is just a starting point. There is wide variation in the character of trade unions and among officials within particular trade unions across time and space. But they all operate under this broader dynamic. There are officials with more left-wing or more right-wing politics. There are smaller union locals where the officials and union structure have a closer connection to rank-and-file interests and/or are more democratically controlled. And there are important differences between full-time elected officials, elected officials who maintain rank-and-file jobs, senior staff, lower-level staff, etc. [T]he bureaucracy is not homogeneous. Union officials in different industries find themselves under varying pressures from below and above. Again, ideologically, union officials are not the same. The division between left- and right-wing union officials is significant. Splits in the bureaucracy — between unions or within a union — can weaken its conservative influence. The fundamental fact, however, overriding all differences between bureaucrats, is that they belong to a conservative social stratum, which, especially at times of radical crisis — as in the 1926 General Strike — makes the differences between left- and right-wing bureaucrats secondary. At such times all sections of the bureaucracy seek to curb and control workers’ militancy. AS LONG as there have been unions for any length of time, they have developed bureaucracies. And as long as there have been bureaucracies within unions, socialists and revolutionaries have developed strategies to deal with them. There are at least four major trends in how the left has approached this question, and I will try to touch on each in turn: syndicalism, red unionism, permeationism and the rank-and-file strategy. Syndicalism is an idea that is rooted in revolutionary working-class anarchism that had significant influence at the turn of the 20th century in places like Russia, Spain and the U.S., among other places. Here in the U.S., syndicalism was organizationally expressed by an incredibly important radical union movement called the Industrial Workers of the World — the IWW, or the Wobblies. The IWW’s approach to the conservatism of bureaucracy was simply not to have one. The Wobblies organized massive, heroic strikes and trained some of the best working-class radical organizers of the early 20th century. But they intentionally established no formal union structures or permanent contracts between employers and workers. This solved one problem, but created another. As soon as the level of militancy among rank-and-file activist died down and the IWW left town, the employers quickly regrouped and immediately clawed back most of the gains made in previous strikes. Red unionism was another response to the political conservatism of union bureaucracies. This was a policy pushed by different revolutionary socialist and anarchist groups, most famously by the Communist International from 1920 to 1923, when it established the Red International of Labor Unions, and then later, for very different and fundamentally flawed purposes, by the Stalinized Comintern after 1928, during the so-called “Third Period” where all Communist Parties (CP) internationally were directed to pursue a policy of dual unionism. Syndicalism and revolutionary or dual unionism are two sides of the same coin: They involve abstention from and avoidance of the messy and challenging world of building consistent socialist rank-and-file organization within a broader union movement. PERMEATIONISM IS a more straightforward idea that is the default practice of reformist socialists throughout the late 19th century up to the present day. But it was also utilized by the Comintern between 1923 and 1928, and then imposed, after the disastrous dual unionism of the Third Period, by Stalin after 1933 and 1935 with the introduction of the Popular Front strategy. I can’t go into an extended discussion of the Popular Front strategy, but suffice is to say that it was implemented directly out of the needs of Stalin’s foreign policy to build an international alliance with capitalist governments against Nazi Germany. In the case of the U.S., this meant the Communist Party emphasizing the primacy of building an alliance with the Roosevelt administration and the newly formed industrial union movement called the Congress of Industrial Organizations, or CIO. Permeationism simply means having socialists insinuate themselves within the union bureaucracy in order to try and shape its politics and practice. This became the default strategy of the social democratic-led unions within the Second International because there was no contradiction between the vision of reforming existing capitalism through parliamentary means and economic advancement through unions. The bureaucracies of unions were well suited to the idea of focusing uniformly on reforms and developing or winning over reformist organizations to do so. In Europe, Latin America and elsewhere, unions and labor-based reformist political parties went hand in hand. In the U.S. prior to the Popular Front period, this had an expression early on in the Socialist Party, which had trade unionists who did electoral work within unions. In the mid-1930s, as Franklin Delano Roosevelt began to implement the New Deal and the CIO was on the rise, the CP oriented heavily on taking the CIO’s top leadership positions, achieving “left-hand man” status to the three leaders of the CIO: John Lewis, Sidney Hillman and Philip Murray. CP members or former members were the chief counsel and publicity director for the entire CIO. More pervasively, the CP oriented on taking staff jobs in individual CIO unions, winning the leaderships and staffs of CIO locals, with the goal of helping to organize the upsurge in unionism and binding that to the left wing of the Democratic Party. The CP still had thousands of rank-and-file militants who did amazing work, but ultimately, that work was circumscribed by the larger goals of the Popular Front — and when the Second World War came along, subordinated to winning the war. The CP and CP union activists supported and enforced the no-strike pledge during the war, defended state repression of Trotskyist labor militants, abstained from important struggles for racial justice and supported Japanese internment. Then, after the war, they were purged out of the labor movement by the McCarthyite witch hunts, as the U.S. ruling class shifted toward the Cold War. Once the CIO won all that capitalism would allow it…sit-downs and mass struggle gave way to union administration, dues collection, labor board briefs, detailed negotiations. The swivel-chair tribe began its own long-lasting sit-down in union office. This tribe rode to office on the broad shoulders of Lewis and the backs of the agitators, the militants, the reds. Once they arrived they turned — dutifully, patriotically, devoutly — to kick in the face those on whom and over whom they had scrambled. Permeationism continues to this day as a de facto strategy of groups that are the inheritors, in one way or another, of the Socialist and Communist Parties. The modern U.S. labor bureaucracy is chock-full of former and current members of the Communist Party, Maoist groups and social democratic organizations — some of whom have made their peace with the system and others who continue to fight, even if they tend to be boxed in and accept the constraints of their positions at times. What these left organizations share is a uniform strategy of seeking top-down reform within unions, a more militant business unionism and left realignment within the Democratic Party. THE RANK-and-file strategy, by contrast, flows from the vision of the revolutionary socialist transformation of society, a project long abandoned by the CP and never adopted by social democracy. It is a strategy for how socialists orient within the labor movement and how they build socialist politics and organization within it. This should first be distinguished from a broader conception of a rank-and-file strategy to rebuild the labor movement. The two are related, but nonetheless distinct. Many non-socialist union militants are clear that any change in the labor movement must come from the shop floor. They are correct, but the strategy they project within the labor left in the U.S — as exemplified by conferences and projects such as Labor Notes, the Center for Workers Democracy and others — has relatively little to do with building socialist organization directly. Our more specific conception of the rank-and-file strategy is rooted in an early 1920s project of the Communist Party called the Trade Union Educational League (TUEL). Led by former syndicalist William Z. Foster, the strategy was based on an uptick in strikes allowing for revolutionary socialists to attempt to build a broad socialist current within the union movement, using socialist politics, workplace struggle, and both rank-and-file and socialist organization. This strategic orientation was revived most famously by Trotskyists in Minneapolis, who not only helped lead one of the three major general strikes of 1934, but built socialist politics and organization while doing so, which then helped them advance class power within the regional trucking industry. One of the Trotskyist leaders in Minneapolis, Farrell Dobbs, wrote two important books on the period, Teamster Rebellion and Teamster Power, which provide an invaluable case study in the successful implementation of a socialist rank-and-file strategy. The socialist rank-and-file strategy was carried through on a much smaller scale throughout the 1950s and early 1960s, mainly through individual socialist militants and the Trotskyist group, the Workers Party, which was the loose predecessor of the International Socialists (IS). One of that period’s most prominent and successful revolutionary socialist organizers, Stan Weir, has a great book of essays called Single Jack Solidarity, which details the struggles of that era. Moving into the 1970s, a major rank-and-file upsurge began to take shape as capital began to embark on what is now known as the neoliberal period. This was marked by production speedups and increasing attacks on what remained of shop-floor organization, combined with the near-universal collaboration between big labor and big business. The International Socialists participated in advancing this rank-and-file rebellion, which is detailed well in the books Rebel Rank and File, edited by Aaron Brenner, Robert Brenner and Cal Winslow, and Rank-and-File Rebellion: Teamsters for a Democratic Union. THE RISE and fall of these struggles produced a tension in how socialists should relate to this upsurge. The IS — drawing from the experience of TUEL, the Minneapolis Teamsters, the Workers Party and the Black-led Revolutionary Union Movements of the late 1960s — initiated or were involved in a number of rank-and-file formations in the Teamsters, United Steel Workers, United Auto Workers and several other unions. These formations differed in their character, but the IS attempted to develop and win a politically left and socialist orientation in many of these formations. A similar development was already underway in Britain, where the Socialist Workers Party (SWP) also succeeded in developing a socialist current within the emerging Shop Stewards Movement. The SWP systematically recruited radicalizing workers and built factory branches that then helped to shape the broader Shop Stewards Movement. This was one significant part of a broader approach to building socialist organization in Britain. Facing a much greater challenge, given the absolute segregation of the socialist and labor movements from each other, the IS, by and large, chose a strategy of industrialization, which meant that the vast majority of activist work by the early to mid-1970s was within unions, carried out by younger radicals who had hired in to those industries. 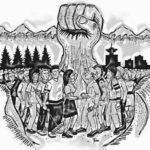 A debate emerged within the IS about how open revolutionary socialists should be within this work and how exactly to introduce politics within workplace organizing. This, among other issues, led to a split in the IS that resulted in the founding of the International Socialist Organization — which favored a more explicit and open approach to being socialists in the union movement. The remnants of the IS was regrouped with other socialist organizations in a new group called Solidarity. The group retained the IS’s version of the rank-and-file strategy and continued to carry out the Labor Notes project, named after the labor column in the IS’s socialist newspaper Workers Power. When the momentum of the rank-and-file movements was brought to an abrupt halt by the onset of recession in the late 1970s and early 1980s, radicals remaining in union work found themselves increasingly surrounded by a conservatizing and demobilized working class in the Reagan era — which led to even more intense pressure to play down explicitly socialist politics. Kim Moody argues in his essay on the rank-and-file strategy that a higher level of class consciousness than exists in the U.S. is required as a precondition for rebuilding a socialist current within unions. Following this lead, many remaining socialists in unions operated on a stage-based approach of building rank-and-file union organization as a necessary step toward a later project of building socialist organization. The ISO attempted to develop an approach that stressed the centrality of politics, even if the audience for those politics was temporarily shrinking. In the weakened state of the left in the 1980s, the ISO placed a premium on rebuilding revolutionary socialist cadre, and the prospects for that project did not lie primarily in the union movement during that period. Even so, the ISO carried out important union work as socialists, organizing both inside and outside the workplace — helping to organize unions and build union struggles as open socialists throughout the 1980s and up to the present period. These debates and divergent strategies continue today. The main difference now, however, is that socialists are on a much stronger footing as the U.S. is experiences the beginnings of most widespread political radicalization since the 1960s. The new radicalization is more class-conscious and socialist-oriented, with the rise of groups like the DSA. In fits and starts, this radicalization has found an expression in union work, with the Wisconsin Capitol occupation, the Chicago teachers’ strike and, most recently, the “red state” teachers rebellion being prime examples. The ISO’s work in teachers’ unions, health care and a number of other important areas, combined with political and organizational developments of the labor left, offer new opportunities for revolutionaries to rebuild a socialist current within unions and the broader working-class movement. We think the theory and practice of an explicitly socialist rank-and-file strategy is the best way to make sure this happens.